Basically, a key difference between the non-Turbo MR2 (SW21) and the Turbo (SW20) is that they use different transmissions. The E153 transmission in the Turbo is renowned for its great strength. A similar E-series 5-speed manual is used in the new C-HR R-Tuned, which is rather fast. E153 is the go-to for high-torque applications. The S54 transmission in my car? Not so much. 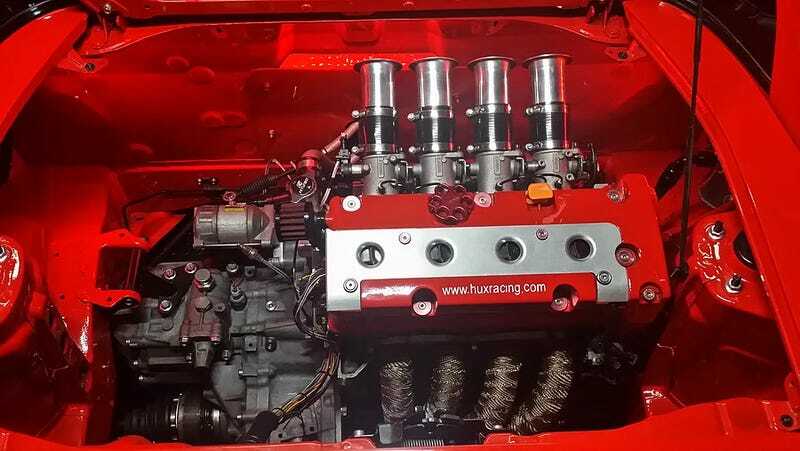 With a much lower torque rating, the S54 gearbox is usually swapped for an E153, as seen in Hux Racing’s “Cannibal” K20 swap kit. Here’s the problem. I’m all about having an immensely powerful car with tons of torque, but I’m even more about minimum viable product. MVP is the idea that one can get to market sooner with a given product by making it sufficient and improving it later, rather than being the best from day 1. Day 1 might never happen if 600 horsepower/torque is a prerequisite. I might also just be cheap. With that in mind, I want to find a way to connect a K20 with the stock, non-Turbo S54 gearbox. The low torque rating of the S54 is usually a deal-breaker, but the K20 has no torque. If there’s a way to get adapter plates to mate a K-series engine to the S54 gearbox, my car will be perfect. Realistically, I don’t need immense horsepower and torque. The K20 is perfect for autocross and daily driving applications. Is this a viable idea? Or would it be more expensive than other swap options?